balance wheels of man's being. Ah, yes ... balance! What a wonderful thing! Riding my unicycle today required an extra dose because my son overfilled my tire and it was tight. That results in being squirrely when cruising. I fell a few times! A lot of that is because I haven't unicycled my four-mile course in a while, hence the low-air tire. 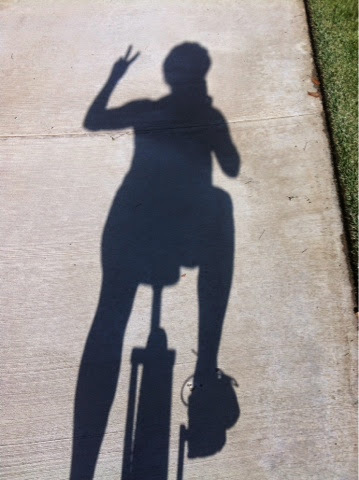 Did you know that a unicycle is easier to ride if the tire is just a tad low/flat? That's how beginners are supposed to start. Blanche needed less air in her only tire today. Oh, but what a beautiful morning to go for a ride. It's Friday! The sun is out, temperature here in Southern California is perfect, many kind people waving, lots of smiles and there I go riding off kilter and falling on my feet (thankfully). Then, hopping right back on my horse! Repeat. Repeat. Losing balance is the sign that I need to get out and cruise Blanche more often! The bottom line? It was sweaty-challenging fun and a perfect start to my weekend. This afternoon, Teckie and I are taking our bikes (the two-wheelers) and driving them up to Santa Barbara for an overnight-er with Miss Piggy, Lui, and their dog-child, Cinco. They live blocks from the ocean so we have fun putzing around, walking on the beach, going out to dinner, you get the picture. Whatever you do this weekend, may God bless it with joy, harmony and safety.